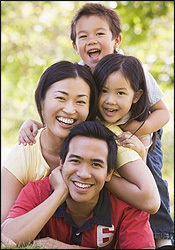 The teams at Main Street Dental and Yonge & Sheppard Dental are proud to provide comprehensive family and cosmetic dental care for your entire family. From regular check-ups and cleanings to beauty enhancing cosmetic dentistry, our team will help you keep your smile healthy and attractive. Please browse through our dental services to see what we can do for your smile. Evening, weekend and full family appointments are available in North York and the Toronto Beaches. Our Main Street office is minutes from Main TTC Subway and Danforth GO stations. Our Sheppard office is walking distance from Sheppard & Yonge TTC Subway Station. Direct electronic insurance company billing. Flexible payment options are also available. Video games for kids to enjoy. Television and salt water aquarium to relax you. and Filipino (Tagalog and Ilocano). Cosmetic, periodontal and general dentistry. Digital intra-oral camera, we can look at the oral conditions of your mouth which allow you to better understand your diagnosis and treatment options. Our hygiene program takes a proactive approach to prevent dental disease and serious dental problems. Low Radiation X-rays - our digitized radiography system provides excellent images with less radiation than conventional x-rays. Prompt attention is always provided to patients with dental emergencies.